Mobile cranes are heavy equipment vehicles that have been designed to lift, lower and transport heavy loads. They are employed in the off-highway industry to move freights beyond the normal capability of a man. Every crane has a set of counterweights which guarantees the counterbalance and prevents the machine of toppling over. Why it is important to apply proper counter weight? The counterweight is too heavy for the boom configuration. The crane is traveling up a slope. When the crane is on soft ground, inadequate timbers are placed under the outrigger pads below the counterweight. Outriggers or any other ground support are not extended or lowered into position and cannot resist the combined weights and tipping forces. If the boom configuration is lifted too high and there is not enough load applied on it. How to Avoid Mobile Crane Accidents? Toppling over happens mostly because of mathematical miscalculation. Therefore, it is essential to set the correct weight and size prior to the manufacturing process during the design phase. 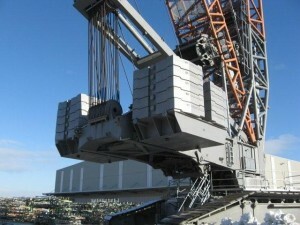 This is the only way to secure the safe performance of the crane counterweight. Where P is the weight of the required counterweight; V – its volume; μ – is the density of the material of which the counterweight was made of and g – the gravitational constant (9.81). Mobile cranes are far smaller than the fixed crane configurations, but still facing the same loads challenges. Especially because of their size, they need small, but very heavy counterweights. Thanks to its density only cast iron counterweights can meet those requirements. Crane load charts should be posted in sight of the operator. They should contain, very well structured, all important information about counterweights, vehicle’s configurations and boom angles. Also, the mobile crane operator should be aware of the vehicle’s limited capacities by structural strength and by stability. Safe and risk reduction safety guidelines should be followed on a daily basis to ensure that the vehicle is in proper working condition. Preventive maintenance and safety inspections should be regularly performed to detect potential accidents. Mobile crane counterweights ensure the safe operation of the vehicle by keeping it stable and upright. Best design practices, most reliable raw material selection as grey cast iron and regular safety inspections are essential for the performance of a high-quality counterweight. FMGC is a subsidiary of the industrial group Farinia and is specialized in gray iron casting. With its 110.000 tons of manufactured cast metal capacity and 330 employees, FMGC is one of the undoubted leaders in this field. Cast metal counterweights applications are used on heavy equipment for material handling, construction, agriculture or on off-highway vehicles. These include forklifts, excavators, front loaders, mobile cranes and tractors. Thanks to our know-how, a result of long experience and permanent improvement, we supply some of the most famous brands as Manitou, Toyota, Pinguely-Haulotte, Dufour, JLG, Komatsu, Liebherr, Manitowoc, Demag Terex, Linde, Nissan, MCI and Volvo.